Home / #DeathPenalty / #SexCrimes / #TrueNews / Africa / #SexCrime in Kenya: Three Men Sentenced to Death for Stripping, Assaulting Woman and robbery. #SexCrime in Kenya: Three Men Sentenced to Death for Stripping, Assaulting Woman and robbery. It started with an uncivilised pat on a woman's backside almost three years ago and ended with a date with the hangman. From left: Edward Ndung’u Kamau, Meshack Mburu Mwangi and Nicholas Chege Mwangi in a Nairobi court on July 19, 2017. On Wednesday, a Nairobi court found three men who were part of a bus crew guilty of robbery with violence and sexually assaulting a female passenger in a case that has drawn huge public interest. 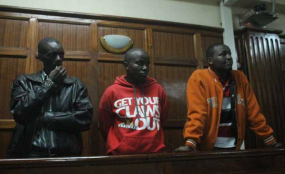 Bus driver Nicholas Chege Mwangi, his conductor Meshack Mburu Mwangi, and petrol station attendant Edward Ndung'u Kamau were described by Nairobi Chief Magistrate Francis Andayi as senseless and uncouth. While sentencing them, Mr Andayi said their date with the hangman should act as a "notice to uncivilised men, who might think that touching a woman's buttocks without her consent is a joke". The three men are, however, not likely to be hanged as Kenya does not carry out the death penalty. The sentences could therefore be commuted to life in prison. Mr Andayi commended the woman, identified in court only as HEW to protect her privacy, for her bravery and for standing up against her aggressors. "It is important to always respect all human beings, especially women," said the magistrate. "Her privacy is not something to joke about." It all began on a cold evening in September 2014 when HEW boarded a minibus on Ronald Ngala Street in Nairobi. She sat at the rear and waited for it to fill up. She then removed her shoes and fell asleep. HEW woke up to find the bus at Roysambu off Thika Highway. She fell asleep again but shortly afterwards woke up to find herself alone in the bus. All the passengers had alighted after the bus reached its final destination, and it was now parked at Millennium filling station in Githurai 44. She picked her handbag and made for the door but Chege blocked her way and touched her backside. Feeling cornered and harassed, her reaction was immediate and instinctive; she slapped Chege. He threw a punch that sent HEW sprawling on the floor of the bus. Her screams alerted other men, who entered the bus and, instead of rescuing her from the claws of her attacker, dragged her to the back seat. Two of them pinned her to the seat while the other removed her underwear and assaulted her. One of the men recorded the incident as his colleagues laughed and made fun of the woman. This video recording that later circulated widely on social media would prove a crucial part of the evidence in court. Although the molesting took longer, the video clip played in court lasted 59 seconds. Chege taunted her all the while, asking her whether she preferred to be raped by him alone or the whole gang. She lied to them that she was HIV-positive and they threw her out of the bus, naked. The woman pleaded with the three men to return her clothes until one of them tossed her garments outside the bus. She quickly dressed up before running across the road, where she boarded a taxi home. She later discovered that she had lost Sh10,200, a Samsung Galaxy mobile phone worth Sh27,000, one bottle of perfume, a clutch bag and make-up kit, all amounting to Sh41,700. All along, she prayed that this would turn out to be just a bad dream. Once home, she bathed and went to sleep, but the following day she was still unsettled and decided to burn her clothes so that she could forget the incident. She later moved to her sister's home far away from her house. Two months later, a friend told her of the video and asked her to report the matter to police. She didn't but when police made repeated calls for the victim to come forward following a spirited social media campaign, she went to Kasarani police station and recorded a statement. By then, two matatu crew members had been arrested as police conducted investigations. Kamau had escaped to Naivasha on learning of the arrests. In defence, the three through lawyer Harrison Kinyanjui told the court that the woman was intoxicated and could not remember anything that happened to her. Mr Kinyanjui also said that it was possible that the woman had mistaken the bus with others registered to Nazigi Sacco, which plied the same route. The lawyer said all the buses of the said sacco had a scorpion mark at the back. The three also disputed the video evidence, saying that no expert was called to testify and confirm when it was made, how and whether some parts had been edited. The magistrate, however, said the video evidence satisfied the requirements of the Evidence Act and that it was buttressed by the woman's own evidence. Mr Andayi said in his ruling that Chege was positively identified by the woman in a police parade while the video evidence placed the other accused persons at the scene. "They all took part in it and seemed to be enjoying by cheering as they humiliated the complainant," said the magistrate. The three were sentenced to hang for robbery with violence and 25 years each for indecently assaulting the woman. The second sentence will, however, remain suspended.